I wasn’t allowed to go home yesterday afternoon. My wife was having a girls only party, and I was strictly told that I was not allowed to go home after church. So I organised with a few mates to get together and have a jam. It was awesome, a whole heap of fun. We jammed over some riffs that we knew, then had a go at a couple of songs which ended up sounding pretty good. I had a chance to pull out some of my heavier guitar tones that I don’t often use in church situations, Dave had a chance to really play his new bass (which he discovered was even more awesome than he originally thought, finding a beautiful dirty side to the slightly bluesy sound he thought he had found), Paul got a chance to play a whole heap of stuff and Isaac got to hit some drums really loudly. It was awesome fun. 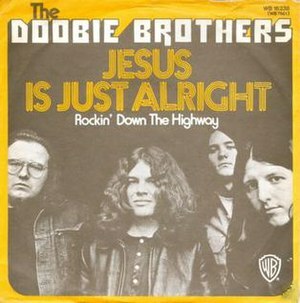 One of the songs we had fun doing was “Jesus is Just Alright” by the Doobie Brothers. I think this is one that I might see if we can pull up for the youth band sometime. Would be a whole heap of fun. Have a listen to that, that will make your Monday go much better. What would your favourite song to jam on be? Previous Previous post: How many instruments can I play?